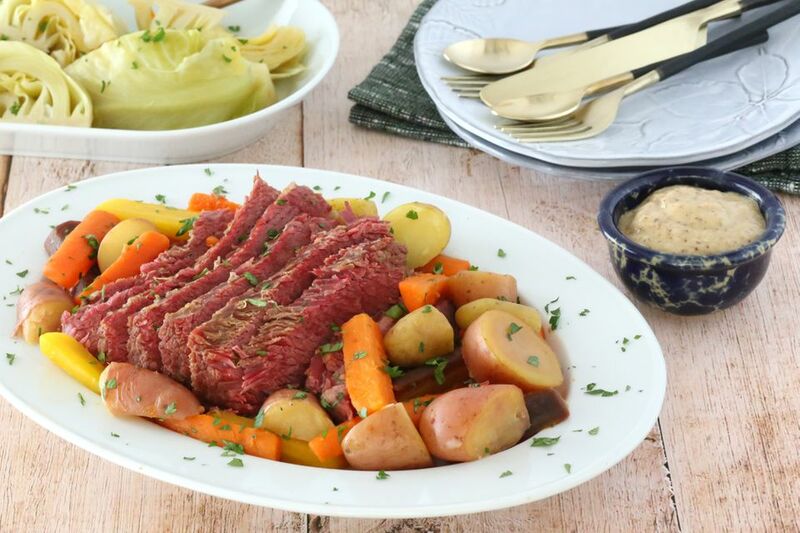 Corned beef is a popular meat for St. Patrick's Day meals and comforting boiled dinners, but don't wait for spring to enjoy the flavorful meat. The most common cuts of corned beef are the brisket; either flat cut or point cut. The point cut is delicious, but it is fattier throughout and doesn't slice well; use it if you want shredded corned beef for sandwiches and leftovers. The flat cut is the best choice if you want to serve neat slices. Some other cuts you might find are the eye-of-round and bottom round. Both are leaner than the brisket cuts but not as tender. These corned beef recipes include casseroles, soups, sandwiches, and home corned beef. You only need 5 ingredients to make this corned beef and cabbage casserole. Feel free to add a topping of shredded Swiss or cheddar cheese to the casserole just before it's finished baking. The Instant Pot pressure cooker makes a complete dinner of corned beef and cabbage fast and ridiculously easy! Treat your family to this meal on St. Patrick's Day or any day of the week. This soup is a symphony of flavor and colors. Use leftover cooked corned beef or deli corned beef in this flavorful soup. Serve this soup with a salad and hot buttered biscuits for a delicious meal. Egg noodles or pasta team up with diced corned beef, cheese, and optional vegetables in this well-seasoned casserole. This all-in-one meal will satisfy even the pickiest eaters. Make your own corned beef with spices and an easy brine, and skip the preservatives! Here's a delicious homemade corned beef recipe, along with instructions for the corned beef and cabbage dinner. Start the corned beef with a fresh brisket about 7 days before you plan to make your dinner. 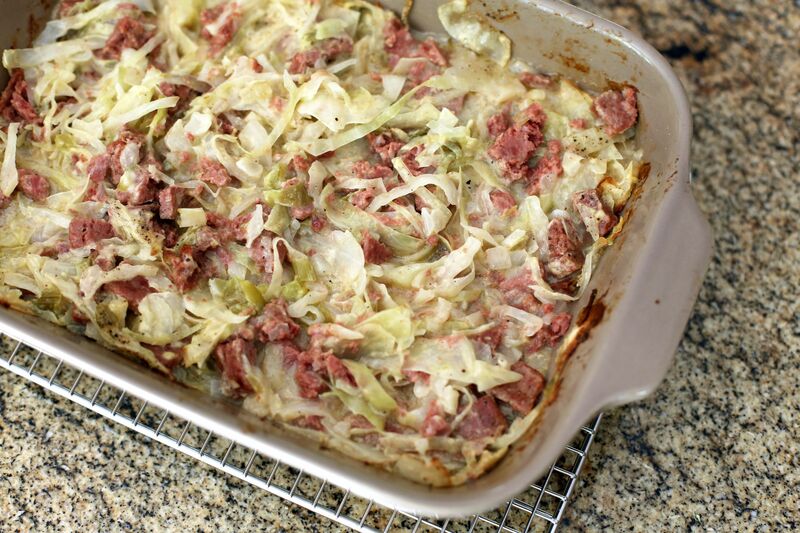 This corned beef hash takes advantage of the leftovers from a corned beef and cabbage dinner, and it is extremely versatile. Leave the cabbage and carrots out and use more potato and beef, or add extra cabbage with less potato. The hash is great with roast beef as well. Beer and beef broth make a flavorful braising liquid for this corned beef. A few spices and some onions flavor the corned beef perfectly. The slow cooker makes this corned beef and cabbage chowder a snap to fix, and it makes use of all of the corned beef and cabbage dinner leftovers. Serve this chowder with hot baked rolls or biscuits for a great family meal. This Reuben casserole is a classic combination of its namesake sandwich ingredients, layered and slow cooked to perfection. This casserole is a delicious meal for the family, baked in one dish, and it's so easy to prepare. Use plain or country-style seasoned hash brown potatoes in this recipe. If you prepare this in advance, cover it with foil and refrigerate for several hours or overnight. When you're ready to bake the casserole, just remove the foil and bake it until it's hot and the topping has browned. A corned beef and noodle casserole is yet another delicious way to use the leftover corned beef, and it's a meal in one dish. Serve this hot dish with a tossed salad and cornbread or biscuits for a hearty meal. Here's another great way to enjoy leftover corned beef, or buy a chunk at the local deli. Serve this tasty and hearty casserole with a tossed green salad or sliced tomatoes. This corned beef brisket simmers to perfection on the stovetop with a variety of vegetables. A glaze of mustard and brown sugar is the perfect finish for this delicious brisket. This combination of eggs and corned beef makes an excellent brunch or breakfast casserole that's easily made the night before. Just pop it in the oven in the morning, slice some fresh tomatoes and some fruit to accompany the casserole, pour the juice and coffee, and breakfast or brunch is served. This corned beef dinner features rutabagas, carrots, onions, potatoes, and cabbage. It's a fantastic boiled dinner, and it's a great mealtime option for any occasion. Corned beef, sauerkraut, Swiss cheese, Thousand Island dressing, and noodles get together in this great-tasting casserole. If you don't have leftover, purchase sliced corned beef from your local deli. This sandwich is a classic Reuben, made with sliced corned beef, rye bread, sauerkraut, Swiss cheese, and dressing or mayonnaise. This is a Reuben sandwich in casserole form. The corned beef, sauerkraut, and cheese are layered with Thousand Island dressing and then topped with buttered rye bread crumbs. Potatoes, carrots, cabbage, and celery make this corned beef a complete meal, and the slow cooker makes it incredibly easy. Here's another novel way to use leftover corned beef. The spiced corned beef makes a delicious addition to carbonara.